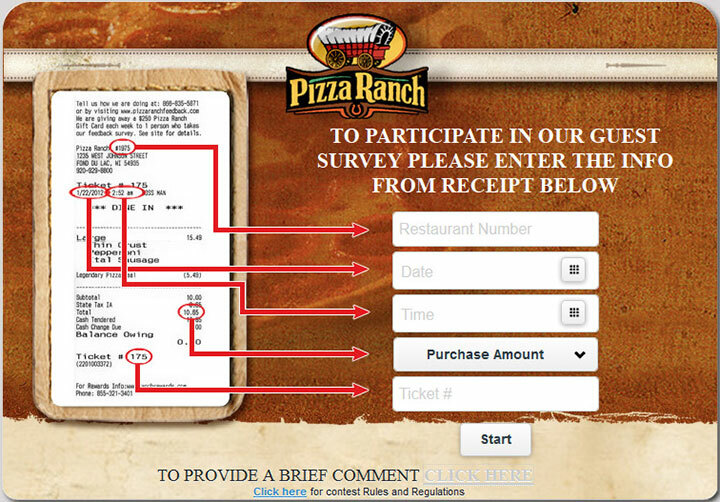 The Pizza Ranch Guest Satisfaction Survey, found at www.pizzaranchfeedback.com, is an online questionnaire designed by Pizza Ranch to help the company understand their customers better. This survey tells the company where improvements are needed, based on the complaints they receive from their customers, like you. This survey is done online for your convenience. Being negative isn’t always fun, but it can serve a purpose. If you had a negative experience at a Pizza Ranch store, they are interested to know it. This is their only way to know how their customers feel. If they don’t know there’s a problem, they can’t fix it. They may take more time working on things that aren’t bad. You will also be entered to win a $250 gift card to Pizza Ranch. Originally starting as a single pizza restaurant in the small town of Hull, Iowa in 1981, franchising and growth would come quickly for Pizza Ranch. There were 10 restaurants by 1986, 50 by their ten-year anniversary, and over 165 locations. They are well known for their excellent pizza buffets, willingness to take orders for pizzas to put out on the buffet for customers in the restaurant, and for having some of the best restaurant chicken in the entire country. This combination of pizza, chicken, and buffet has been an extremely successful one and has continued to fuel the growth of Pizza Ranch throughout the Midwest. Have your recent Pizza Ranch receipt that contains an invitation for the survey. Enter the store number in the first box, the date in the second box, the time in the third box, the purchase amount in the fourth box, and the ticket number in the last box. There is a picture of a receipt with arrows directing you to where the information is. Click Start to begin. Answer questions. These questions are there to help you rate your experience. Consider each question carefully and give an honest answer. It is also important to read directions, as you may be able to provide more than one answer. Enter the sweepstakes. Read the directions and follow them. You will be asked for certain contact information. You cannot enter the drawing without providing the information.